Helena - so. much. murder. And that is literally just the main characters. I'm not sure if this says anything about the show as a whole, but I thought it was worth pointing out since this episode featured all of our wonderfully criminal characters doing yet more things that are actually illegal. Fun times! But thematically, the point was a little bit softer. Going off of last episode's musings on the nature of family, this episode seemed to be a meditation on the places where family falls apart. Family and its failures. Or people outside the reach of family. So, let's start with the storyline we left off with. 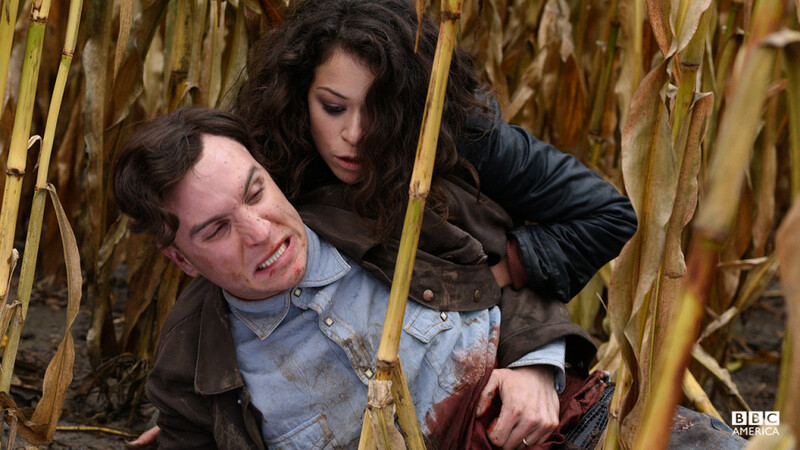 At the end of last episode, Sarah was trapped hiding in a barn while Bonnie (Gracie's mother) shot Mark to death in a cornfield for the crime of defiling her daughter. This week we come in with Sarah rushing over to Mark while Bonnie is distracted, finding him alive, and grabbing him so they can run away. Mark is deeply confused about why Sarah would help him, but her logic is sound: she needs Mark in order to find Helena. Which means that she needs Mark to stay alive and not bleed out. Unfortunately for that plan, Mark has been shot twice and is bleeding out fast. There's only so much you can do with a belt-tourniquet. They find an abandoned farmhouse, break in, and then have an incredibly disgusting interrogation/medical assistance scene. It was gross. But Sarah finds out what she needs to know. Mark is after the tissue samples they're sure Henrik had, but all he found was that stupid box. Sarah, unlike Mark, understands that boxes full of papers are occasionally useful, so she goes back to the motel room to get it. She manages to find some important documents which, verified by Cosima, refer to an experiment Henrik did twenty-five years ago. It seems that rather than preserving the tissue samples, Henrik (who was Duncan's research assistant, apparently) stole them and used them to create a child. A boy. 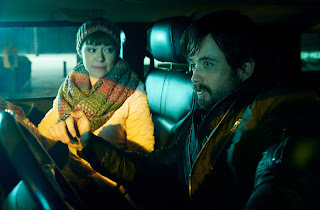 Mark, having managed to track Sarah back to the motel room despite being shot and nearly out of blood, reveals that Henrik and Bonnie did originally have a son. He died. But...if they dig up his grave they might be able to get their all important tissue sample! Like I said above, this episode had even higher rates of illegal activity than usual. Just a warning. Because Mark is injured, Sarah has to be the one to dig up the grave, and while she digs she and Mark muse on their relationships. Sarah calls him brother, but he doesn't want to be linked to her. And as we learned during the interrogation earlier, the Castor clones weren't raised with parents or monitors. They were raised with each other, only each other. Like a pack of wolves, they were raised to hunt. So there's no way that Mark could have run away with Gracie, and there's no way that he can run away now. His pack brothers will find him. And they do. Rudy, who has been tracking them all episode, comes on Mark and Sarah just as Sarah has dug up the sad little body. He attacks them, threatens to kill Sarah, chases her through a barn just like last episode, etc. The only difference is that here, Mark rallies himself and goes in after Rudy. He stops Rudy from shooting Sarah by reminding Rudy that he's in charge. He's the superior officer and Rudy is his "little brother". It's a whole new side of Mark, and I like it. So Rudy and Mark take the tissue samples and prepare to return to base. Mark has apparently given up on escaping this time. He knows they'll track him down and he no longer has anything to trade. But the question remains of what to do with Sarah. They aren't supposed to leave any loose ends. The implication at the end of the episode is that Mark decides to have Sarah taken with them back to base. Which is an interesting choice. It could mean, on the one hand, that Mark is still her enemy and working against her. It could also mean, however, that he's helping her get to Helena. Or it could be both. Hard to say. That's it for Sarah's storyline, though. Lots of crime and shadiness, no? Well, over in the suburbs of Toronto, the crime and shadiness continue. It seems that for this season at least, Alison and Donnie have been put on the backburner. Or maybe not. I thought that last season too, but then they ended up quietly impacting the outcome of the whole season. So maybe their weird little subplot will factor in at the end. Who knows. What I do know is that apparently Alison and Donnie are very good at selling drugs. We come into them this episode with Alison counting her drug money and Donnie rushing inside because he thinks he's being followed. Yep, just a few short days after starting drug dealing, they're already making waves. Alison figures this means they should find somewhere safer to keep their drug stuff than in the house, but when she goes to take it outside to move it to a storage locker, there's a sketchy man waiting. Apparently Ramon did not have license to sell his business to them, nor did he actually go off to college. Ramon's former boss would like a word with the Hendrixes. No options to get out of it. And that's super frustrating because Alison is so dang good at selling drugs! How dare this man come in and try to tell her what to do! Donnie tries to be a tough guy at the meet and bring a gun and protect the family, but the drug guys quickly see that Alison is the one in charge of this operation. She's pulled into a black SUV to talk to the main guy only to discover that it's...actually her high school boyfriend, Jason Kellerman. Seriously. The drug kingpin of the suburbs is some guy she used to date, who she dumped, and who is clearly still into her. Alison, your life is officially the weirdest. Anyway, Alison keeps her cool and holds her own and ends up walking out of the SUV with a business deal. She's going to own these streets, because Alison freaking Hendrix is a badass whether she's dealing drugs or getting her kids to swimming practice on time. Oh yes. Meanwhile, in sad breakup storylines, Cosima is not taking the loss of Delphine well. Having apparently cleaned up Felix's apartment after the impromptu brain surgery, she's back to lying on the couch eating eskimo pies and feeling sorry for herself. Felix, of course, isn't having it. He drags her out to a bar, signs her up for a dating app, and generally pesters her to get the hell over Delphine. 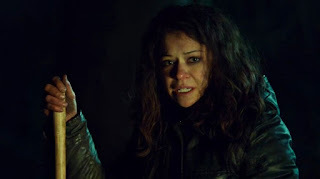 Tragically, that's pretty much all we get of Cosima this week. She's not unstable enough to get her own storyline right now. What's interesting is that Gracie apparently is important enough for her own storyline. It's short, but it's there, and it speaks to what I said last episode about this being a show where family becomes an expanded concept. Gracie might not be a Leda clone, but she is one of their sisters now, bound by blood and experience. Which is what makes it so painful to see Gracie being folded back into the Prolethean community she fought so hard to escape. Her mother is all smiles in bringing her back in, but it just takes one really horrible feeling up from an old blind man for Gracie to realize that nothing has changed. The Proletheans are just as manipulative and abusive as ever. And things only get worse when she goes to change into a new dress and discovers she's bleeding. She's having a miscarriage. To say her mother is not pleased would be an epic understatement. Bonnie forces Gracie into a prayer vigil to keep the child, but Gracie can't exactly stop herself from miscarrying. The child is lost and Gracie is thrown out. It seems she was only let back in at all because she was carrying Henrik's child with Helena, their "legacy", and now she has nothing. Nothing and no one. But, honestly, Gracie? I think you're better off. Your family is genuinely abusive and murderous. It's time for a change of pace. Literally almost anything would be a step up from here. Finally, Helena continues to be the most resourceful person that Castor has ever underestimated. With the help of her hallucinated scorpion friend, Pupok, Helena manages to use a series of clever ruses to get outside her cell and look around the compound where she's being held. She finds some very interesting things, but the most interesting is some kind of medical room where they're keeping a Castor clone and experimenting on him. Dr. Coady is there. It's very suspicious. Helena has a bag of tricks that's pretty freaking full, so eventually she manages to gnaw a key to her cell out of a steakbone they gave her, escapes, and makes her way to the medical room. There she finds the Castor clone, Parsons, strapped down and forced to endure horrors. Helena has a chance to escape, and Pupok urges her to go, but she can't leave the sight of Parsons, his head torn open by his own mother, an experimental pincushion. He begs her to kill him, and she obliges. But the most heartbreaking part of the entire storyline? It's not Helena setting off an alarm and losing her chance to escape. It's not Parsons literally begging for death or the horror that's hiding under his little shower cap. It's the moment when Helena shushes Parsons gently and tells him, "We have both been abandoned by our families." That hurts. It hurts because it's so easy to see why Helena would believe that, and yet we know it's not true. We the audience know that Sarah is moving heaven and earth to find her, but Helena has no reason to think that. Up until now, Sarah has not come for her once. So why should she think this time will be different? Ugh. Feelings. So many feelings. In a lot of ways, this episode ends with everyone roughly where they began. Sarah is at the whim of crazy people with guns, Cosima is pining over Delphine, Alison is terrifyingly competent at drug dealing, Gracie is adrift, and Helena is locked in a cage. But in another sense, this episode has given us a taste of what everyone (except for Cosima, really) is like when the pressure is on. It's showing us who these people will be and what choices they will make. Helena is choosing mercy and Sarah is choosing family. This will be an interesting reunion, I have no doubt. Oh, and someone should really start a counter of how many laws are broken per episode on this show. I feel like it would be very educational. Crime should not be this adorable. Excellent analysis! The whole Parsons thing really got to me since what was done to him seemed to be done only out of cruelty. I assume it was done to examine what was wrong with their brains and causing the "glitching", but there are easier and more humane ways to examine brainwaves. I guess I see it less as intentional cruelty and more as a decision which did not view Parsons as a human who might even be capable of being horrified by this. The idea that they already see him as dead and so he as a person has ceased to matter. But yeah. That was probably the most horrifying part of the season so far, and I'm including Gracie's family in that. Every patriarch we see on this show, and I'm including Coady in that for all that she's a woman, is more skin-crawling than the last. And I love it, in a horrified way; I love that the show offers no excuses for how monstrously the clones,' including the boy clones,' abusers act. The "a decision which did not view Parsons as a human who might even be capable of being horrified by this" reminds me of what I said about Doctor Nealon, that it was like he couldn't conceive of Sarah even having a perspective on what he means to do to her. Which is an interesting similarity with Coady in light of him maybe knowing more about Castor than he lets on. Or maybe it's just a thematic similarity, the way Henrik had more in common with Leekie than Tomas did, Nealon has more in common with Coady; a representation of how the different rationalisations, justifications, and idealisations are all covering up the same acts of dehumanisation. I do really like the parallels drawn between patriarchal oppressors on this show. It supports the idea that when one is in the business of exploiting human beings and dehumanizing them, viewing them as means rather than ends in themselves, one starts to look like all the other dehumanizers that have come before. Evil's a distinctive smell, as they say in Aida. It really did feel like a race to the bottom this season, though, with Drs. Coady and Nealon fighting over which one of them was the worst. It seems that rather than preserving the tissue samples, Henrik (who was Duncan's research assistant, apparently) stole them and used them to create a child. A boy. Huh. So does this mean that Henrik is the reason the Proletheans found out about the cloning projects? Though they seemed to know more about the Ledas than the Castors, but that might just be because DYAD is easier to infiltrate. And as we learned during the interrogation earlier, the Castor clones weren't raised with parents or monitors. They were raised with each other, only each other. I wonder if this is true. Under the circumstances, I don't doubt Mark on it, but I could see Castor putting one or two in with multigenerational military families (to herd them into the forces that way - no more than that, or it would be discovered - they'd have much less ground to hide them in than DYAD). Someone on another forum pointed out that raised together doesn't necessarily mean treated alike. If they can't be replaced, the Castor clones are no good for expendable cannon fodder, they're not supersoldier material (though I suspect, given what Helena's healed from, Leda clones are tougher than most people, which probably means the Castors are too) - but they are good for studies into what upbringing/training regimen *makes* a better solider. Regardless of any of that, it means sisters is a big upending of Mark's world - but in the complete opposite way than it was to Sarah's. Yeah. The Proletheans are foul. Topically foul, too, right now. Being away from them is definitely a plus, but it won't help her feel any less lost for the time being. Parsons, his head torn open by his own mother, an experimental pincushion. He begs her to kill him, and she obliges. And for the first time, Helena manages to take what she was made into and put it to a compassionate end. We the audience know that Sarah is moving heaven and earth to find her, but Helena has no reason to think that. Up until now, Sarah has not come for her once. So why should she think this time will be different? So much heartbreak. In my whole "Helena love and be loved, Sarah trust and be trusted" lens, this should have been a turning point: Helena finally knowing that someone loves her enough to risk her life to find her, Sarah finally proving to herself as much as anyone that she can be worthy of trust. But it's been snatched away from them both, because it was convenient for Coady and Castor. Later in the season, Rudy remarks that they used to all curl up together and sleep in one big puppy pile, so I think we can assume that Castor was raised all together in the same facility, but you're very right that it does seem unlikely that they were treated all the same. If for nothing else than that it's interesting how they all hold different ranks. Poor Gracie. I hope she's a bit happier now. I feel like it was a turning point for Helena - sacrificing her escape for someone else, someone she doesn't even know, just because she feels empathy for him. Ugh. I actually put off watching this episode and the next for exactly the reason that I was worried it would break my heart. Which it did. Fortunately, then it put it back together!